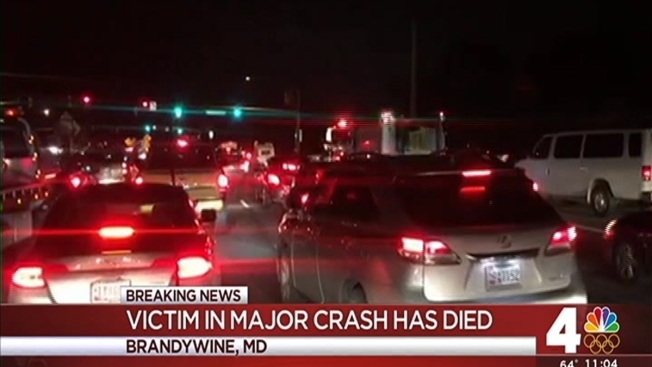 One person has died after a crash that injured a total of eight people in Brandywine, Maryland, Thursday night, fire officials say. Maryland State Police said about 8:21 p.m. Thursday night troopers responded to the scene of the crash on US 301 South at Chadds Ford Road. Joseph Gregory Rice, of Clinton, was driving a Nissan Maxima on US 301 North when he lost control of the car, state police said. The car crossed the center median and entered a southbound lane of US 301 where it was struck in the passenger side by a Ford Excursion, state police said. Willow Kearse Rice, also of Clinton, was in the front passenger seat of the Nissan and was pronounced dead at the scene, state police said. The crash left another person in critical condition. Six people in the Ford Excursion suffered non-serious injuries, state police and fire officials said. News4's Shomari Stone reported traffic was backed up for miles on US 301 South due to the crash.